And when you talk to potential customers on the phone, you sound genuine, helpful, and frank. No fluff. No marketing drivel. No sleazy sales talk. You give honest advice. But what happens when you write copy for your brochure or your website? Do you sound as sincere as you do on the phone? Marketing drivel seems hard to avoid. Most websites are full of it. A dash of sleaziness sneaks into your copy without you noticing it. Creepiness crawls into your brochure just because you couldn’t find the right words. How can you eradicate the marketing prattle and write honest copy that sells? 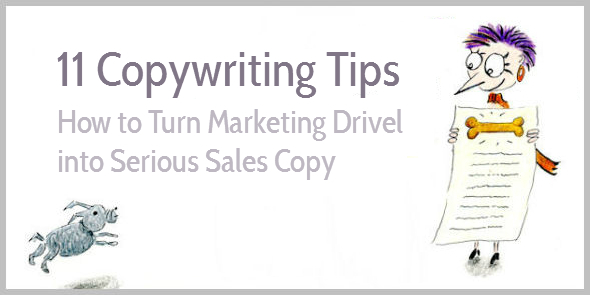 Let’s look at 11 copywriting tips that give sleazy sales-ness the middle finger. Follow these tips, and your copy instantly becomes more sincere, more enchanting, and more persuasive. Do you want people to listen to you and follow your suggestions? Just give them a reason why. How are you going to make them happier, healthier, or richer? Which problems, complications, and difficulties will you help to avoid? Learn how to create persuasive content. Sign up to receive free updates. What do your readers really want? Try to avoid fake benefits and focus on a benefit your readers are looking for. Most real benefits are related to saving money, making more money, becoming happier, being free from fear and worry, a feeling of belonging etc. You know the type of testimonials that sound like they’re written by a marketer? The sugar-coated words that tell you how wonderful, amazing, and super-perfect a service or product is? Do you think anyone believes these fantastic testimonials? Well? Write story-based testimonials that help you overcome objections. Henneke is an amazing copywriter. I’d highly recommend her to anyone. I wasn’t sure about hiring Henneke. She seems a little crazy and she’s not even a native English speaker. But the copy she’s written for my business helped me to win more customers. And she was fun to work with. Note: just like all other examples in this article, the above example is made up. In business they don’t exist. I’ve never seen objections magically disappear. You need to address them. If customers think you’re too expensive, then explain how you help customers save money, how you help them make more money, or explain how much more enjoyment they’ll get from your product or service. Prove your value. What objections do your customers have to buying from you? How can you address them? Copywriting is about sales. And selling is about taking away customer objections to buying from you. Further reading: The old-fashioned Aga sales manual, written by the legendary David Ogilvy in 1935, provides examples of how to overcome objections. Marketing messages become drivel if they go on and on about a company and its products. The quickest way to turn drivel into sales copy is to address a benefit or a problem your customers have first. Exclamation marks are the signs of a lazy writer or a sleazy salesman. Simply remove all exclamation marks from your copy. Period. Superlatives like best or easiest are a surefire way to sound insincere. Only use superlatives if you can prove why you’re the best. We provide the quickest printing service in town. Get your brochures printed in 48 hours or receive a 25% discount. Further reading: Do You Make These Two Subtle Copywriting Errors? If marketers have nothing to say, they add adjective upon adjective to their sentences. It makes your readers think yeah, yeah, what nonsense or it sends them straight to sleep. This relaxed, romantic collection of beautiful cookware has a look all its own, right up to date yet completely classic with a result that’s perfect for your kitchen. The classic look of this cookware collection suits most kitchen styles. Show pictures of your cookware. Or explain who inspired the design. That’s much more interesting than marketers’ hogwash. You’ve edited your copy to remove the marketing fluff. Now, imagine talking to your favorite customer on the phone and read your copy aloud. If your customer slams down the phone, then your copy is still too sleazy. Get back to work. If she gets a little impatient and interrupts you, then you’re nearly there. Just a little more fluff to remove. And if you can’t persuade her to buy, then you’ve not addressed her problems or you’ve picked the wrong benefits. Ask her how you can help. When you write sales copy, you need to think about your customer (of course!). But you also have to remember who you are. Be yourself. Be honest. Be enchanting. Us Dutchwomen, we like to use a good swearword every now and then! Chock full of great examples and helpful links. Direct, pithy, and candid. Superbly helpful (maybe that one’s OK)? Happy cycling/muttering and of course writing. Great, down-to-earth advice as ever. What I like about your suggestions is that they’re easily applicable, a real toolkit for getting marketing copy right. And it’s nice to build a gradual picture of the person behind the blog ;-). Thank you for stopping by, Caroline. I appreciate it! Yikes, I think I may have written a sentence way to similar to the mumbo jumbo example for the cookware. Couldn’t I just make life easy and use “Buy this, damn it!” for every product on my site? Oh, but no exclamation mark. As always, this was a fun piece to read with lots of great advice. Thanks Henneke. Thank you for stopping by, Carole. A great number of my notebooks are finding their pages filling fast everytime I read a blog update from Henneke! I’m guilty of doing all of the above at one point or another. I think a lot of the time it’s the pressure to get up to a certain word count, whether for SEO purposes or because the employer has the idea that more content = better content. I think a lot of this fluff comes about from the quotas that are set. I know I run out of things to say when it comes to pots and pans. Yes, that’s an excellent point. Word count can be a big problem. When there’s nothing left to say, you can only add more drivel. And often people think that if you write more words, they should pay you more, but it’s often harder to be concise. Great post Henneke! 🙂 I lot of business writing is done this way, and many consider it normal. But because it’s normal, it doesn’t impact the reader anymore. I really like way you’ve showed the tips with the ‘much better’ version! Thank you. I agree with you – marketing fluff seems normal, but I don’t believe it truly connects and engages readers. It encourage people to scan rather than to read because too much text is irrelevant or even nonsensical. Enjoy your work. It is often timely. I like the succinctness. I have to say, though, sometimes adjectives provide a necessary padding. Might be useful to distinguish when. I’d love to share the cute dog photo and quote on my FB page with a reference to your work. Yes, that’s absolutely right. Adjectives can add meaning to text – especially if they’re specific, sensory, or emotional words. If you’re looking for more information on using adjectives, then check out this post about how to avoid the destructive power of adjectives. It’s funny how the best copywriting tips are sometimes just a lesson in communication. Yep, you’re right. Many tips are also applicable when having a face-to-face conversation or talking on the phone or presenting in a big meeting, too. Brilliant, helpful article – thank you. Thanks for sharing this, Henneke. We’ve been making a big push lately to cut out the “fluff” in our copy, and the results have been outstanding. Will have to give some more of these tips a try — especially with our testimonials! I think most folks are hard-wired to give you the glowing testimonial, because they think it’s what will help you the most, and the linked story about asking the right questions is awesome. I really find your post “enchanting” (I know that is your way of saying Wonderful. On my blog, I use “FantaFab”). The tips are so helpful and revealing. The idea of imagining yourself calling a potential buyer and she slamming down the phone is quite hilarious. I love the overall touch of humor around here. Great to be here. Yes, we all have our favorite words – mine are enchanting and seductive. Favorite words help to define your voice. Is Tope your first name? How do you pronounce it? “To” is pronounced as “Tour”; Pe is pronounced as “Pair”. Anyway, the p sound in my language (Yoruba) does not exist in English and vice versa. However Tour-Pair would do just fine. Maybe over time, we would know each other better and I would be able to send you a voice note of how my name is pronounced. What about yours? How is it pronounced? It’s FantaFab being here again. The stress is on the first syllable and it sounds like “hair” without the “r”. The two other e’s are unstressed and sound more like the “e” in “listen”. It almost rhymes with Seneca. Yes, most of us use or have used exclamation marks, but they lose their impact when overused, plus they can come across as overly sales-y. I completely re-wrote marketing copy for a client recently. The original copy was full of exclamation marks. The new version had no exclamation marks at all and it sounds so much friendlier and more persuasive. Thank you for stopping by, Richard. What is your inspiration behind copywriting? Why do you sell what you sell? Is it just to pay bills or because you like it. I am working on writing some content and will be doing this for the next couple of months. I’d really like to know more. It’s both. I love writing, but I also need to make a living. I’m lucky that I’ve found something I love doing but that also generates an income. Spot on Henneke!!! Straightforward and sensical.The side bar that says “FREE Snackable Writing Course” is a proof to your awesomeness. Thanks for this post! Great that you provide examples and links for further reading. This makes your post way more helpful and serves as an example of good copywriting. Thanks Henneke for the article. A lot of useful information here. Have to learn for myself to be more specific about things (tip #2). I am a starting blogger so basically all the tips are very welcome (just deleted the exclamation mark. Already making progress :-). Yep, being specific makes a big difference to writing—no matter whether it’s sales copy or blog content. Great advice, Henneke. I agree that it’s best to avoid using any unnecessary adjectives. When I’m writing about a mediocre topic, I’m often tempted to add a bit more emotive vocabulary to make things sound ‘interesting’. However, as you say, what’s really important in copywriting is knowing what readers want, and making sure they understand how they will benefit from whatever you’re writing about. Yes, even when writing about a boring topic, it’s still useful to consider why your reader cares about it and which pain points your topic addresses. When you look at it this way, then even boring topics become interesting. Loved this post. I’ve been working on improving my writing, in particular for my business, and your tips here are pure evergreen (given some of the comments go back to 2013 and it’s still getting more). I always use exclamation marks. I’m not sure if I really agree with that statement. Thanks, Henneke for another great piece of work. There may also be a difference in experience between Europeans and North-Americans. I am happy to use exclamation (and emojis) in social media, but would rarely use them in my blog posts or in sales copy (unless it’s really an exclamation). Thank you for your comment, Becky. I appreciate it.